Education Perfect Languages is designed by Language teachers for Languages teachers and their students. We understand the challenges of modern language learning, and have developed a range of activities to suit many teaching and learning styles. The following outline shows how each of our units is structured to take away the need for a physical textbook. If you click to expand the text, you can find practical ideas on how you can use each of the sections within your classroom programme. All content is now accessible on smart phones, meaning that students are able to complete work whenever they wish to, provided they have access to their mobile phone, and data/internet connection. Like a textbook, each unit begins with an interactive Introduction section which outlines all of the key language for the unit and includes multiple-choice questions to help students master the vocabulary. Classroom Instruction: You could use the Introduction slides with the whole class to introduce the vocabulary and expressions instead of using a PowerPoint presentation. To do this, we recommend using presentation mode. The multi-choice questions can be done together as a class in a quiz situation initially, to engage the students. The Flipped Classroom: Students can also be assigned the Introduction section of the unit to work through in their own time. They can read and listen to the slides and complete the questions to reinforce their learning. This can be done at home to support in-class time. Students can complete these sections as many times as necessary to feel confident with the learning material. This is especially powerful when providing work for students who are absent from class, as they are able to gain a full picture of what they need to know for the remainder of the unit despite their absence. Content Revision: Students can refer back to the information slides in the Introduction section at any time during their learning. Like a textbook, all of our units contain an extensive Listening Comprehension Section, which contains 8-10 listening comprehension texts accompanied by a variety of questions. These texts are all original texts written by our Education Perfect Languages team and they are all recorded by native speakers. Work together as a whole class: The teacher plays the sound file through their computer and students complete the questions. The questions could be projected on the board or on a handout if the students don’t have individual devices. Work at their own pace: Teachers can assign the listening activities to students to complete at their own pace. This way, the students can repeat the sound files as many times as necessary and they can choose the speed. This could be done in class or outside of class time as part of a flipped learning programme, allowing more class time to engage in other activities. Self marking and easy to track: All of the listening activities are either self marking or have model answers, so if students are working through these at their own pace, there is no need for the teacher to mark them. However, the teacher can easily track student progress and view and provide feedback on the extended response answers. 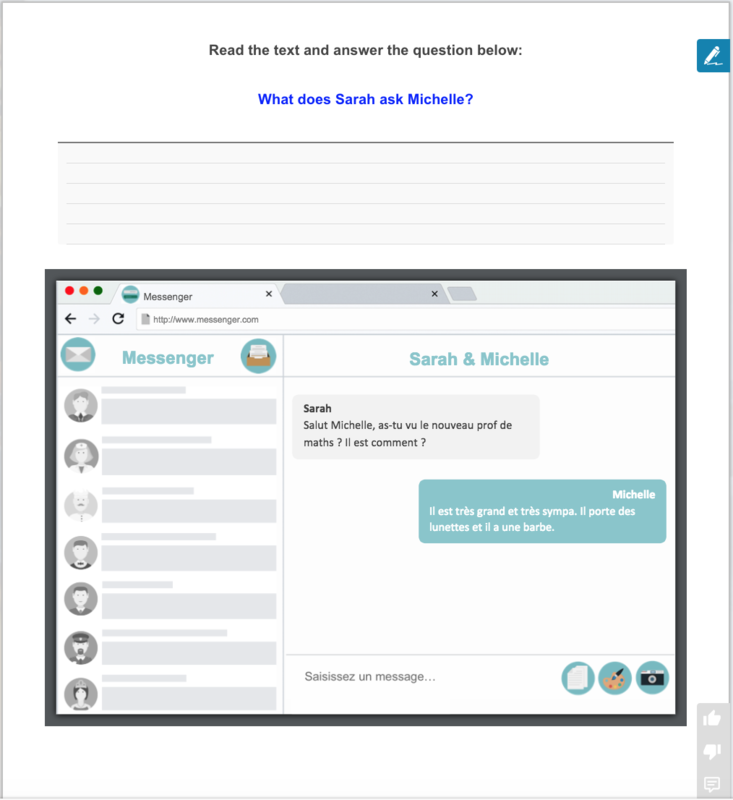 Write their own questions and texts: Following completion of the listening activities, teachers could ask students to either write new questions to go with the texts or to write their own listening comprehension texts similar to the ones provided. Conversation practice: After completing the listening activities, students could have conversations with each other based on the text. Unlike a traditional textbook, we offer extensive speaking practice. This includes simple single-word pronunciation right through to topic-based monologues and conversations. Complete at their own pace: All of our speaking activities can be assigned to the students and they can complete the activities at their own pace either in class or at home. The activities work best if the student has headphones with a microphone; however, this is not essential. This provides a safe but meaningful way for students to practise spoken language without the necessity for them to produce in front of the class. Play back: When students complete the speaking questions, they can play back their answer and listen to what they have recorded. They can re-record until they are satisfied with their responses. Teachers can also listen to what students have recorded and provide feedback. Peer Review: With our new Peer Review function, teachers can opt for students to review each other's speaking and give their classmates suggestions on how their speaking can be improved. This is a very powerful tool and is most successful if you spend time in class talking about success criteria for speaking tasks. Reflecting on speaking in this way will help to empower students to turn the same thought processes to their own work, resulting in deeper thinking about how their efforts compare against set criteria. Spontaneous Speaking Questions: In addition to our Languages in Action tasks, we have a folder in the Content Library titled, “Skills Practice: Speaking”, which is a bank of spontaneous speaking questions designed to help students develop their conversational skills. Students are required to listen to a question and then record their answer. These can also be assigned to students as a task and students can work through them at their own pace. They can repeat as many times as they choose. Different options: All of our speaking activities could be used in conjunction with other speaking activities you might be doing in class, such as speed dating and role plays. 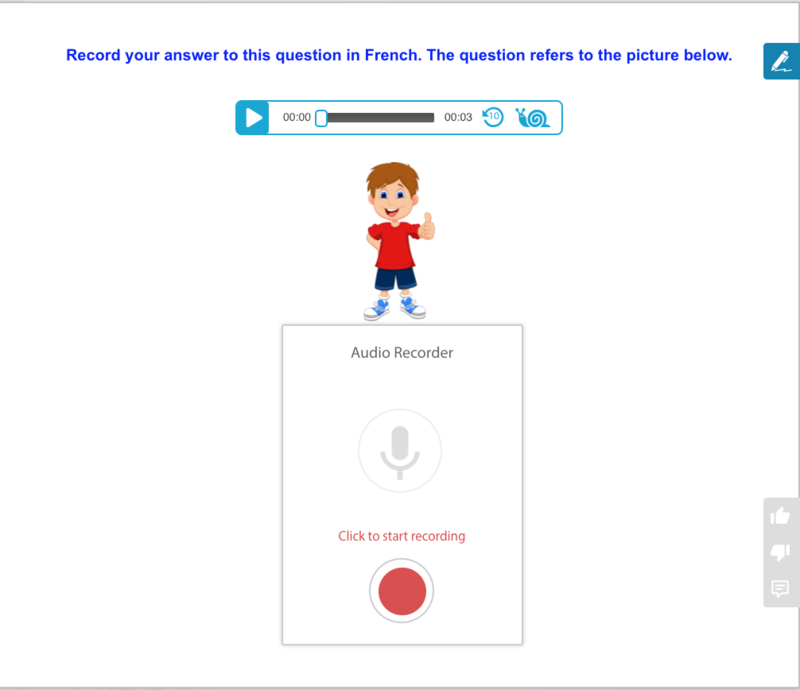 You could use our speaking tasks as scaffolding prior to doing the other tasks, where the students self assess before doing other “live” speaking tasks or vice versa. Speaking Assessments: Our platform can be easily used for speaking assessments, either by assigning our speaking tasks as an assessment or by creating your own speaking assessments within the system. This is easy to set up and a really effective way of keeping a record of students' speaking progress. Complementary training is available to help teachers set up these assessment tasks. Create your own speaking activities: Teachers are also able to develop their own focused activities where students are required to produce or recite language samples, thus personalising their programmes. Complementary training is available to help teachers acquire these skills. Different management options: If it is too noisy in your classroom having everyone record their speaking practice at once, you could consider the speaking activities as one activity in a “learning stations” rotation or you could have some students working outside of the classroom - in the corridor, in spare rooms, outside or in any other spare space you might have available. Whichever is the most appropriate for your school. Like a textbook, our Languages in Action programme also contains a Reading Comprehension Section, which contains 8-10 engaging Reading Comprehension texts covering a variety of text types with a range of questions. Pre- Reading Activities: You could complete some pre-reading activities. For example, read through key vocabulary that are in the text, predicting vocabulary that might come up in the text, brainstorming what might be in the text based on the title. Work together as a class: You can work through texts as a class with the text on the projector. The teacher could read through the text or the students could take turns reading out loud, sentence by sentence. You can also work through the questions together as a class. Work individually: You can assign the reading comprehension tasks for students to work on individually at their own pace. Work in groups: Students might work in pairs or groups on the reading comprehension tasks and read through the texts together out loud. They could then complete the questions in pairs or groups but all enter their individual answers into the system. Extension activities: For higher level students, you might ask students to write their own version of the text, changing some of the details. Students could also rewrite the text in their own words or present a summary in the target language of what the reading passage was about, perhaps offering their own experiences or opinions on the points raised. Conversation based on the text: You could ask students to have a conversation based on the reading text. To prepare them for this, you could brainstorm some questions as a class. Write new questions: You could ask students to write their own questions based on the text for other students to complete or to write their own new texts. As you would find in a textbook, each unit contains extensive writing practice where students are required to use the language they have learned in a particular unit to complete a writing task. Teachers can view and give feedback on their students' writing. Work at their own pace: The writing tasks can be assigned for students to complete at their own pace. Students can take the time to self assess and then submit when they are happy with their work. Work in groups: You could also assign the task and students could complete it in pairs or groups or as part of a “learning station” rotation. If you choose this option, please specify to the students that all group members still need to submit their own piece of writing. Peer Review: If appropriate for your particular class, you might choose the option of “Peer Review” as part of the task setting, which means that once students have completed the writing tasks, they then review the work that others have done and can give their classmates feedback. This would be most effective after having discussed as a class what the characteristics of a good piece of writing are, or the aspects that you are focussing on in a particular unit. Task or Assessment: The writing tasks can be assigned either as a task or an assessment. Differentiation: For differentiation, you could set different tasks/assessments for different students. For students who are struggling you might choose for them to complete a modified selection of the writing activities and for ones who require extension, you might require them to complete all of the activities. Write your own questions: If our pre-made writing questions aren’t exactly what you want your students to do, you are able create your own writing tasks. As with all EP Writing tasks, teachers can give ratings and feedback to students based on their work. This lends itself to the establishment of a student writing portfolio that is stored, graded and monitored online. Just like a textbook, each of our units contains contextual Grammar lessons, which are relevant to the unit. These are made up of detailed explanations followed by a variety of scaffolded activities. The vocabulary learning programme within our system goes above and beyond what a traditional textbook can offer. Our engaging programme requires students to learn vocabulary in 5 different modes (listening, reading, dictation, writing and speaking). Classroom Instruction: The grammar explanations are available to students and teachers alike, meaning that the slides can be projected onto a smart board or smart TV very easily. This, in turn, negates the need for teachers to write on the board, and students to copy from it, freeing up more in-class time for practice. Additionally, students then have exact, accurate notes to refer back to when working outside of the classroom. 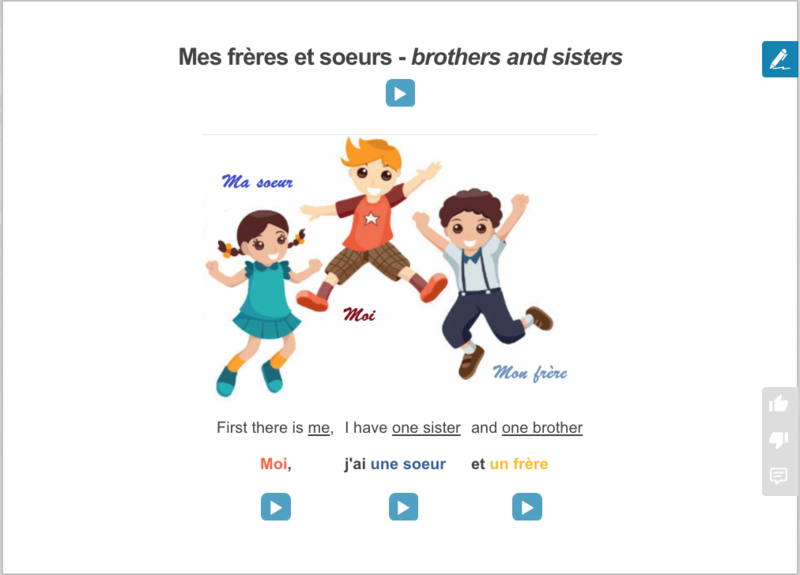 Individual or group work: The grammar lessons can be assigned to students to work through independently either at home or in class or teachers can work through them with the whole class. They can also be done in a group or pair situation or used as part of a “learning station” rotation. Differentiation: For differentiation, teachers can choose to assign different parts of the grammar lessons to different students. For example, for students who are having difficulty, you could just assign the Introduction and recognition sections but for students who need extending, you could assign the full grammar lesson including the free production section. At beginner level, you may decide not to assign any grammar to some students and save it for extension for higher level students. Follow up activities: For more follow up activities following the completion of the grammar units, you may ask students to complete speaking and writing tasks using a particular grammar point. Some ideas may include: speed dating with some brainstormed questions relating to the topic where students have to include the grammar point, writing a paragraph relating to the topic where they have to include the grammar point, making absurd sentences using the grammar point, making posters which explain the grammar point to put up around the classroom, making posters with sentences using the grammar point to put up around the classroom, making videos or songs which explain the grammar point. Classroom Instruction: All vocabulary lists come with a preview so that students can view and listen to all the words in a list. You might choose to use this as a whole class activity where you project the preview on to the board and students listen to each word and then repeat together. Different modes: Any vocabulary list within our system can be assigned as a task and teachers can choose which mode/s they want the students to complete. The tasks can be completed in class time or set for homework. Ideally, if completed prior to class, students come to class prepared and already familiar with the necessary vocabulary. Differentiation: With the ability to assign different modes (listening, speaking, reading, writing, dictation), this allows you to differentiate by assigning different modes to different students as may be appropriate. Vocabulary tests: All vocabulary lists can also be assigned as an assessment, which is an easy way for you to manage regular vocabulary tests if this is something that you do with your students. Languages in Action vocabulary lists: By the end of 2018, we are aiming to have extensive vocabulary lists available to accompany our Languages in Action units, which means you can assign vocabulary lists to students alongside the core components of each unit. This is a great tool to help them master all vocabulary in the unit. Alongside this, we will also have PDFs of the vocabulary lists available so you can print these for students or you could use them to make a number of paper-based activities such as match up cards, to provide students another option for learning vocabulary. Customisation: Vocabulary lists can also be refined, amended and added to in a variety of ways. Teachers can also create their own vocabulary lists from scratch. We empower teachers to be able to manage this themselves, but we can also do it for teachers if that is preferable. Like a textbook, we offer original assessment material for our Elementary and Beginner Languages in Action units. These are based on each of the units and contain vocabulary, listening, reading, writing and speaking questions. Pre-test: They can be assigned as a pre-test before completing a unit to see if the students have any prior knowledge on a topic. Post-test: They can be assigned as a post-test following the completion of a unit as an end of unit assessment. This can provide valuable data for reporting. Different conditions: Assessments can be completed in class under monitored conditions or at home at the student's own pace. Targeted remediation: Once the students have completed the assessment, the system offers the option for targeted remediation, to provide each student with an individual pathway of learning to meet their needs based on the results of their assessment. Easy to adapt: Assessments can be easily edited and adapted to ensure that they meet the needs of your students. If our pre-made assessments do not fit what you are looking for, it is also very easy to make your own. We can provide guidance with this. Above and beyond what a textbook offers, we have the option of an Immersion Edition of our Languages in Action programme. This has all of the instructions and questions in the target language. The students are also required to answer questions in the target language. We offer Current Events Units which are mini units aimed at advanced level. A new unit is released each term and is based on something relevant or topical in the target country at the time of writing. These units contain relevant keywords and useful background information on the topic, followed by listening and reading comprehension passages and questions. Finally in each of our Languages in Action units we offer an Extra for Experts lesson. This contains an extended task, which requires the students to use the language from the unit in creative ways. Immersion for all students: If you follow an immersion programme you could assign the immersion edition to all of your students. Differentiation: You could use the immersion programme as a way to differentiate by assigning it to students who require extension. IB or Cambridge: We would recommend using the immersion programme if you follow the IB or Cambridge programme. Non-English speaking background: If students are from a non-English speaking background, they may find language acquisition simpler in an immersion format, without needing to add in English translation and thinking. Availability: Currently, this is available for French and Chinese at Intermediate and Advanced level, but we aim to have this ready for Spanish, German and Japanese by the beginning of 2019. Extension: You could assign them as an extension task for Advanced level students. Class discussion/debate: Students could complete the units outside of class time and then during class, you could hold a class discussion or debate about the topic. Assessment material: You could assign the Listening and Reading comprehension tasks as an assessment or exam. Write their own text: Students could complete the mini unit then write their own text about the particular current event or issue. Availability: These are available in French, German, Spanish, Chinese and Japanese and are usually released once a term. Extension: You can assign the Extra for Experts activity as an extension task for students who require it. Complete at your own pace: You can assign the Extra for Experts activity for all students to complete at their own pace. Assessment task: You can assign the Extra for Experts task as an open assessment task. Relief teacher/ Work for showcasing: You can use the Extra for Experts tasks if you require an extended amount of work to be covered by a relief teacher, or if you need work for a subject showcase, open night, or to guide a holiday project for students. For each level of our Languages in Action course we also have a Teacher's guide available, which contains unit outlines, listening transcripts, curriculum documentation and other useful documents outlining how you can best use the programme. Whole class activity: You can project them onto the board and go through the texts as a whole class. Put texts into order: The teacher could print the transcripts, cut them out and students could put them into order, either while listening to the texts or without listening to the texts. Read dialogues in pairs: The teacher could print the transcripts off and students could read them through in pairs taking turns at each of the different parts. They could then perform to the class. Speed dating: With the printed or projected conversations, students could also read through these in a speed dating situation. Pronunciation practice: Teachers could use these dialogues as scripts for recitation practice to improve pronunciation, by re-uploading the passage to a new task with sound recorder embedded and having students read the passage aloud. In addition to all of the above, there are a number of other ways you can use EP in the classroom. Click here for a document which gives some suggestions of other games and activities you can do using Education Perfect Languages. As always our experienced team of qualified Teacher Consultants are happy to chat with you about your own programmes, and offer advice and suggestions on how to best get Education Perfect Languages to work for you and your students. Feel free to get in touch with us at support@educationperfect.com.